i just had to have a nose out of the front door, as when we went to bed last night there were flakes a fallin'. as well as on mountains, i love snow, i have no idea why, maybe it's positive association with fun based activities, skiing, climbing, snowmen, snowball fights, etc, etc, but i love it. i think it's the way it makes everything look so picturesque and clean as well. one of my favourite memories of recent snowfalls, was a few years ago when the guys that worked for me at the time arrived at work having fought there way through the slushy roads to make it in, only for me to map out the plan for the morning, which was for me to go out and leave them to split themselves into two teams, computer i.t. guys versus creative graphics guys, and they had to build the best snowman, and then send me a picture of both snowmen for me to confirm a winner, which they looked at me agog, until i then mentioned the winning team would win a spot prize of £20. i placed the crisp twenty pound note on the office desk, and they all looked at me, and then sped off in the direction of the snow covered garden to create their masterpiece. later that morning my phone pinged with two pictures of amazing looking snowmen with various accompanying details, including one pushing a wheelbarrow, which if i remember was the winner. simple fun, but interesting how we all revert back to a childhood state so quickly. interestingly this week i was watching a video sent to me by my mentor darren hardy, who i have spoken about before in my blog. well this week darren shared some golden nuggets about a gentleman he interviewed some years ago, who was over 100 years old, but whose name he didn't share, alluding to the fact that he was one of the most successful businessmen of his day, though i still have no idea who it was, but his story was awesome. darren is an amazing storyteller, and it wasn't long before i was scribbling and screen grabbing titbits from his video, and one of the gems he unveiled to me was that nothing captivates the human attention like a game, and that you can turn difficult tasks and behaviours that almost everyone else hates into a game. i started thinking about this concept, and how i could apply it to my life, but before i could get started, i realised that only this week i had unbeknown to me at the time, applied darren's methodology into my life. chloe and i had got our first order of coffee in retail packaging, and we had the idea to try to sell it online using social media. now personally instagram is my favourite social media platform, but for us in bigmoose land facebook seems to be the best place for us, and always has the most impact. so, armed with 46 bags of coffee, i challenged chloe to a competition to see who could sell the most coffee in any way, until we had sold all the bags via social media. we took a cheesy picture, see below, and set about our task. we both set about contacting our own personal networks, and the post on bigmoose's facebook page, started to get some interest from friends family, and supporters far and wide. "we've just sold two bags!" chloe exclaimed. and the premise that we had instigated to identify who had actually sold the coffee kicked into play. our simple message, was along the lines of " we are having a competition to see who can sell the most coffee, so please buy some, and show your loyalty to either #teamchloe or #teamjeff"
we totally underestimated how much people like games. "totally on #teamjeff i'll have five bags mate." "it's gotta be #teamchloe two bags please." "two bags, one for each of you," the messages flowed in. "wow, this is pretty exciting" we both agreed. "we've sold over half dad", chloe informed me. "just, is good enough for me, just winning the gold medal is always good enough!" "it's not over yet dad." "this is unreal, we've nearly sold out." i resorted to whatsapping friends out of desperation to help me. the silence, and the tension in the room was palpable. team chloe's leader shouted, and i knew my fate. when i first delivered this child twenty three years ago, and chose to love her, clothe her, educate her and feed her, never in my wildest dreams did i imagine i would have created such a monster! who does this to their father? who makes the man who has dedicated his life's work to serve her, wear a cardboard box saying 'LOSER' on it, on his head for the whole internet to see, and future generations of google searches to pull up this image on it's first page? a child of lucifer is who. i shall speak of this no more, but for every action, there is a reaction, i am a fan of the long game, and this is by no means over. 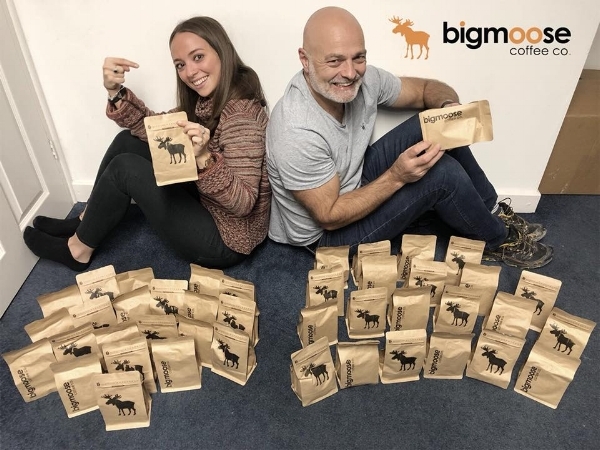 anyway, the facebook battle, even though finished, had some positive effect, as more orders for coffee poured in, and we have sold just under 100 bags of our first bigmoose coffee co offering, in what essentially was a game. i reckon this is pretty awesome, and hopefully is an indicator for what the future holds once we open, and was very timely when i read darren hardy's story suggesting that humans are captivated by a game, and i am going to see if i can incorporate it into my life a bit more, as if you make things fun, surely that's gotta be a good thing right? so, the coffee shop build is now firmly back on track, and we are starting to build some momentum, with visits from the fire officer, external works commencing this week, and next week seeing some real positive steps being taken internally. one of my mates, the lovely matt thomas, who has been a bigmoose supporter for years in all guises, has got a team of his vectos work crew coming in after work on tuesday to get involved doing a number of things, which will be brilliant for everybody involved, and shows a real community spirit, and hopefully his team will enjoy the experience, and feel an ownership of the place forever more, i love this kind of stuff, and is very much what this project is about, the sum of all of our parts being amazingly strong. so if you wanna come along and help in any way, or have a eureka moment with a supercool idea, please just drop us a line, we really want to have as many people as possible feeling ownership of this dream. to wrap up with today, our 'don't forget your toothbrush' campaign has riproared into life with the david lloyd filling theirs over three times already, and amazing support from the general public, so if you're in south wales any peter alan branch will take your donations, and here is their branch network. also the lovely jayne at university hospital wales has just put their bin out in the concourse at uhw, which is here. off the record, the peter alan m.d., andrew barry mentioned to me that he would like to get 10,000 products donated, so how cool would that be, and here we go again, making it a game, maybe give it a try in your life, and see how it goes. anyway, enjoy the festive period, finish the year strong, red line it to the end, and do something flipping amazing for someone in your world this week, it's totally within your power. we don't share info btw, promise, have a great week.